A monthly survey of business sentiment in Bulgaria has found improved confidence in all sectors, pushing the total business climate indicator up by five percentage points in May 2016, the National Statistical Institute (NSI) said. There was an improved business climate in all sectors monitored in the poll – industry, construction, retail trade and the service sector – the NSI said. 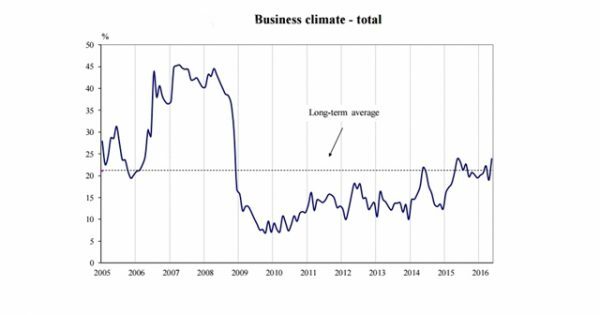 In industry, the business climate indicator was up by 4.1 percentage points compared with April 2016, boosted by managers’ more favourable assessments and expectations, according to the institute. However, the uncertain economic environment continues to be the main factor limiting business development, followed by insufficient domestic demand. In the construction sector, the business climate indicator was up by 6.7 percentage points, again with improved assessments and expectations among managers in the sector.